Suzanne Collins' The Hunger Games is a literary phenomenon to rival the likes of Twilight, and 2012 sees the big screen adaptation of the first novel in the series. As with the novel, the film is set in a dystopian future America called Panem, which is divided into 12 districts ruled over by the reigning Capitol. Each year, a boy and girl from each district are picked as 'tributes' to participate in The Hunger Games: a televised match to the death broadcast to the whole nation. 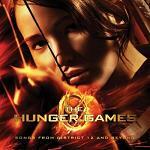 Jennifer Lawrence stars as heroine Katniss Everdeen, whose sister is selected for the games. Katniss then offers to take her place and is shipped off to the Capitol with her male counterpart, Peeta Mellark (Josh Hutcherson). Prior to the games themselves, Katniss, Peeta and the other tributes are groomed in front of the cameras in a nightmarish reflection of the trashy reality TV to which we've become accustomed. Directed by Gary Ross, the film has justly drawn acclaim for its gripping performances, satirical punch and intelligent design. Musically, the production has a somewhat tumultuous history. Danny Elfman was originally signed to compose the score with producer T-Bone Burnett overseeing the soundtrack as a whole. 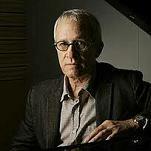 Then in December 2011, Elfman dropped out due to scheduling conflicts, only to be replaced by the ubiquitous James Newton Howard. Howard is of course no stranger to such circumstances: back in 2005, he was a last minute replacement for Howard Shore on King Kong, and the end result was one of his greatest scores. It was a prospect that stoked many a film score fan's curiosity. How would Newton Howard approach the project? In short, he's done exactly what any professional would do: match Ross' sombre vision, a world flecked with violent action and elegiac humanity. The end result is a score that's compelling yet surprisingly subtle given the noisy franchise expectations hanging over the project. Although there are themes in Howard's score, one senses that they will be teased out properly in the next movie, should Howard stay on. However, the music does convey the film's narrative very effectively, although it should be said that the 43 minute album is only a sampler of the music Howard composed for the movie (reportedly more than 80 minutes worth). Things kick off unobtrusively in "The Hunger Games" with a tinkling cimbalom over a bed of smooth strings and electronics; there's a sense of pastoral calm but with an underlying menace lurking behind it, in-keeping with the cinematic representation of District 12. "Katniss Afoot" continues with a greater sense of percussive movement, whilst also bringing in some lovely fiddle work and woodwind in the manner of Howard's very own The Village, in order to convey Katniss' bond with nature and the outdoors, not to mention her skill with a bow and arrow. "The Reaping" marks the first official moment of darkness as moving strings and brass indicate the participants' anguish as they're picked for the games. This contrasts with the beautiful strings and angelic choir in "The Train", hinting at the indulgent pleasures and potential fame awaiting them in the Capitol (a beautifully scored moment in the film). Here, the groundwork is laid for the later thematic development. Things change again in "Entering the Capitol": after a slow choral build-up, the track explodes with vaguely Middle Eastern orchestration and an electronic pulse, presumably to emphasise how alien the Capitol seems to Katniss and Peeta. A highpoint then occurs in the duet of "Preparing the Chariots" and "Horn of Plenty". Following the tense build-up in the former, the score then erupts in a powerfully anthemic blend of brass, choir and percussion in the latter, Howard adapting Arcade Fire's song of the same name. It's the perfect ironic juxtaposition: playing up the heroism and infamy of the tributes as they make their first public appearance in the Capitol, a perfect example of incisive film scoring. Things continue apace in "Penthouse/Training" and "Learning the Skills". 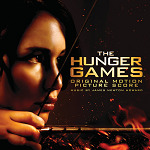 Following the return of the cimbalom motif for Katniss, Howard brings out the assortment of powerful, clattering percussion and further Middle Eastern instrumentation to emphasise the imminent violence and the brutality of the training. "The Countdown" returns to the Reaping motif, building a sense of dreadful tension in the manner of The Dark Knight as the characters are released into the arena to mark the start of the games. The latter half of the score is where Howard's most beautiful material comes to the fore, painting a vivid picture of dignity in the face of horrifying odds. "Booby Trap" is perhaps the most low key piece in this section, before "Healing Katniss" brings back the beautiful Village-esque fiddle along with a gentle acoustic guitar. The score's highlight then arrives in "Rue's Farewell", as Howard's moving main theme makes its first full appearance. An elegiac, heartfelt, powerful piece for massed strings and soft choir in the manner of I Am Legend, it both laments the tragic events whilst providing a note of solemn defiance; it's Howard's most memorable theme in quite some time, and one anticipates if it will be used to a greater extent in the later films. The score then calms down in the next few tracks, "We Could Go Home/Searching for Peeta/The Cave", emphasising the burgeoning relationship between Peeta and Katniss with a pleasingly understated touch. The first two pieces develop the central ideas for Katniss, bringing in a greater sense of movement to emphasise her increasing confidence within the context of the games themselves, whilst the third introduces a lovely note of candid intimacy. There is then a final savage action blow-out in "Muttations" which erupts after a loud orchestral stinger and proceeds with a brutally exciting action piece for percussion and electric guitar. The score then concludes with a final rendition of the gorgeous main theme in "Tenuous Winners/Returning Home", ending on a note of graceful humanity rather than heroism, in-keeping with the feel of the film itself. 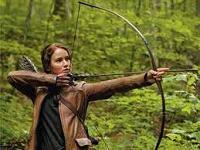 The Hunger Games is a score that will likely confound many expectations. Given the stranglehold Hans Zimmer's Remote Control studio has previously held over such movies, Newton Howard's subtlety and restraint might come as a shock. It's certainly not the bombastic, in your face, action-laden score many people will have expected but that's entirely to its credit. In truth, an overbearing score would likely have proved detrimental to director Gary Ross' vision, and Howard deserves much praise for imbuing his largely quiet score with just enough emotion and instrumental textures to keep it interesting. It takes some work to reveal the multitude of ideas at work and those requiring a score with a dominant thematic presence will likely be disappointed. However, one has to look at the music in the wider context: as the first in a potential new series of scores, it's a scene-setter, establishing the pieces of the puzzle which presumably will take on greater resonance as the series develops. Howard was clearly working under tricky circumstances, both in terms of replacing Danny Elfman and having to come up with a score that's at once subtle and engaging. There's no doubt he's succeeded, and it's exciting to speculate on what he'll come up with next. The score is available on CD or via MP3 download at the following links: Amazon.co.uk and Amazon.com. A separate album of songs from the film (overseen by T-Bone Burnett) is also available.